On Saturday, November 14th, 2015, Team Fastrax™ will be performing their amazing American Flag demonstration jump, as part of the opening ceremony for the UC Bearcats football game. The Bearcats are a Division I NCAA football team in the American Athletic Conference. We are honored to be performing our patriotic American Flag skydive for the University of Cincinnati Bearcats game, especially as a salute to our nation’s veterans. 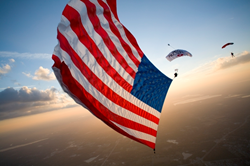 Team Fastrax™ will perform their much anticipated American Flag demonstration jump as part of a special veteran salute at the upcoming UC Bearcats and Tulsa Golden Hurricane game on Saturday, November 14th, 2015. The game starts at 7:30pm, and as part of the opening ceremony, Team Fastrax™ will jump in with their 1,800 sq. ft. American Flag as well as the 1,100 sq. ft. UC flag. The demonstration will also feature their most requested show, the night pyro. It often causes UFO sightings in the surrounding areas. Four TSA fireworks-licensed Team Fastrax demonstrators will exit the aircraft at 5,000 to 4,500 feet above the ground. Pyro is ignited under canopy all the way to 500 feet then the demonstrators land in the target area. The show will be shown on the scoreboard with live air-to-ground video, so spectators can enjoy the experience on a whole new level. According to the Nippert Stadium website, the University of Cincinnati marks the beginning of a new era in the football program’s history, entering 2015 with the opening of the newly renovated Nippert Stadium. Fans entering the gates might not recognize the third-oldest facility in the NCAA FBS after it underwent an $86-million renovation and expansion project that started in December 2013. Through numerous renovations, the structure situated in the middle of the Clifton campus has retained its early-century brickwork, wrought iron gates and trim, giving Nippert a comfortable old-time stadium charm and appeal, while remaining a classic showplace for college football. UC has gone from having nearly no premium seating options to the addition of 1,100 scholarship club seats and 53 indoor and outdoor suites of varying sizes in a new four-story press box. Team Fastrax™ is sponsored by Selection Management Systems, a leading provider of criminal background checks and pre-employment screening services. Team Fastrax™ is the most ambitious professional skydiving team in the world. The parachute demonstration team has a roster of more than twenty-nine active members, with a collective of more than 300,000 skydives. Team Fastrax™ performs exhibition skydives all over the world, for audiences large and small, as a patriotic display or product promotion. For more information and to purchase tickets, visit the University of Cincinnati Bearcats website.